July 20th 2012: Today the Regions of Climate Action (R20) (www.regions20.org) and IDEAcarbon (www.ideacarbon.com) entered into a strategic collaboration to analyze the financial risks associated with the R20's low-carbon energy projects. The R20 works with sub-national (state and regional) governments worldwide to develop, finance, implement, and communicate low-carbon economic development projects - primarily renewable energy generation, energy efficiency, waste to energy, and fuel switching projects. IDEAcarbon is an independent and professional provider of ratings, research and strategic advice on climate finance. Working together, the R20 and IDEAcarbon will ensure that thorough risk assessments for all R20 projects are completed prior to sharing R20 project business plans with investors. This important risk assessment process will ultimately streamline and accelerate the identification of the most appropriate financiers for innovative energy projects around the world. "The R20 is delighted to be working with IDEAcarbon, and believes that its expertise in climate finance along with its world class Climate Finance Platform will accelerate the R20's ability to quickly develop high quality "bankable" projects worldwide" said Christophe Nuttall, Executive Director of the R20. Shandi J Modi, founder of IDEAcarbon, commented "R20 and its members are the world's most significant sub-national entities motivated towards low carbon growth. 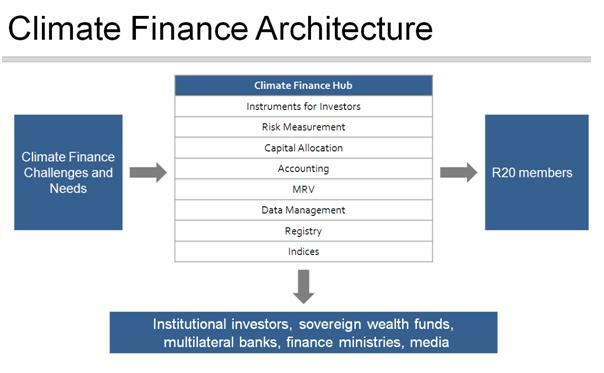 IDEAcarbon's products and platforms will provide key technical expertise, transparency and standards to enable meaningful climate finance flows. Our work to date has been designed exactly for this type of organization which is seeking action "now". We are excited to be working with this very important organization." Under the agreement, IDEAcarbon is entrusted to perform third party analysis of R20 projects, develop robust analytical methodologies, and benchmark standards for wider adoption. In addition, IDEAcarbon will support R20 through secondment of climate finance professionals to R20's Geneva headquarters. IDEAcarbon is an independent and professional provider of ratings, research and strategic advice on climate finance. Founded by Shandi Modi, it is part of the IDEAglobal Group whose advisors include Lord Nick Stern and Mr Nitin Desai. IDEAcarbon's services are designed to provide leading financial institutions, corporations, governments, sub-national entities, and others with critical products and ratings, tested to institutional standards, which fill the gaps in climate finance and practical policy and market intelligence. IDEAcarbon combines its strength in risk assessment, risk evaluation and ratings with its ability to introduce novel and relevant financial structures to enhance liquidity and transparency in environmental assets. IDEAcarbon is fundamentally a neutral partner, not constrained by any relationship, investment, or market positioning exposure in any environmental market. For more information please visit: www.ideacarbon.com. All information contained herein has been obtained by IDEAcarbon from sources believed by it to be accurate and reasonable. Although reasonable care has been taken to ensure that the information herein is true, such information is provided 'as is' without any warranty of any kind, and IDEAcarbon in particular, makes no representation or warranty, express or implied, as to the accuracy, timeliness or completeness of any such information. All information contained herein must be construed solely as statements of opinion.